The mimosa trees are blooming here. We noticed them a few days ago when driving to Birmingham. The hillside beside the Interstate was a pink cloud that changed color from fuschia to almost white. stems smaller than a thread. They look ethereal. When those trees are in bloom, the hummingbirds are in heaven. Each tree has thousands of blooms. The only downside to them is they are invasive. The pods they produce look like green butterbeans. Apparently, birds find them tasty, because they gobble the seeds and their digestive system doesn't consume the seeds. When the birds poop, a new mimosa is born. And so on. We had a few growing along our garden several years ago. And then we had a grove. Before long, we had a forest. A guy came. He had a bobcat with a grinder on the front. It made short work of those mimosas. Now we can grow things in our garden. But, the mimosas are still beautiful. Fast forward to this evening. Our neighbor called and said I have something I want to show you. He was cryptic on the phone. He owns proper not far from us that goes all the way to the Mulberry River. I went to get the scoop. 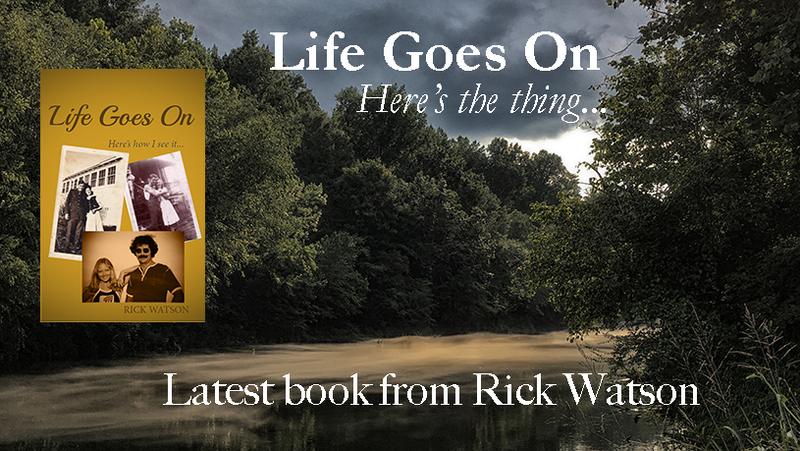 When we were on his Polaris (an all-terrain vehicle about the size of a golf cart), he said, "There's an eagle's nest down here with two eaglets in it." All of a sudden, my interest spiked. We wobble down an old fire lane road toward the river. About a half mile from his barn he cut the engine and pointed into the pines. "There, in the forks of the pine. See it?" he said. I did. We sat for a long time looking at the nest to see movement from the chics, but nada. I made my best eaglets sounds. OK, I have no idea what an eaglets sound like, but I tried. Nothing. My friend said he'd had the best luck early morning. He said if I was an early riser, we'd head out one morning and see if we could see the mama and her chics. I told him I would be back. And I will I'd love to get some pictures of an eagle and her babies. We know your mimosa as a persian silk tree (albizia julbrissen). The birds love them. They are subject to borers here. An eagle nest? I suspect I would be camping in a spot to ensure I saw that. Looking forward to your photos. I will keep going until I get a photograph. My friend say the Eagle flies over my house too but I’ve never seen her/him. I really want to see your shots of the eaglets!! Your mimosa tree looks like a sensitive plant I once grew from a seed. The leaves would fold when touch. 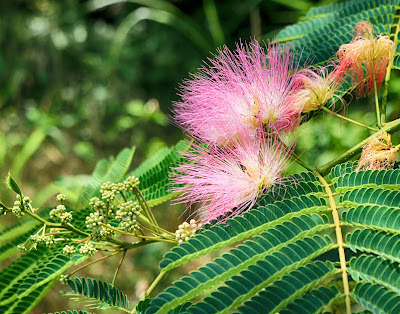 It's also call Mimosa something... and it has the same type of flowers. I'm sure the eagles are flying over your area as they have a wide territory. The nest looks like a new one as it's still small. They built them up to huge size over years. They mate for life. We have a pair of eagles that are nested in a tall pine tree and there are babies in it. I can hear the piercing noice the eagles does early in the morning but they are kind of quiet right now. They have been there for about 15 years now. 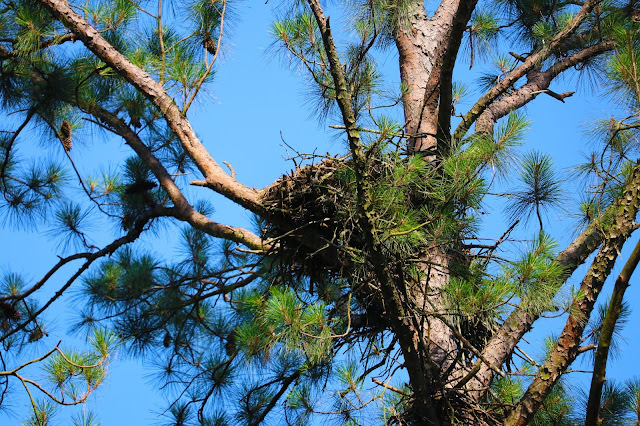 They had to rebuild their nest when hurricane Arthur destroyed their tree with two eaglets in their nest. They all survived. Good luck with sighting the eagles and their young ones. It seems there is no end to the treasures you have there in your part of the world. Baby eagles are a topper on the cake. Now you know they are there, I'm sure you'll go back again and again. Your photo opps seem to be endless. I like mimosa trees, I like eagles even more. I've never heard of mimosa trees. Isn't there a drink called mimosa? Anyway, it sure is pretty! Eagle watching is very popular here and I did see one fly over the house once. I wish they would nest in our pines! I guess having water near by is a plus to attracting them! I'll look forward to your pics..I know they'll be awesome!